The Mountain Pine Beetle (MPB) epidemic in the Interior of British Columbia is no longer just a forestry issue. The Ministry of Forests and Range projects that 80 per cent of the merchantable pine in the province’s central and southern Interior could be killed by 2013, and well over half that pine could be dead by the summer of 2007. Lodgepole pine is a major feature of many ecosystems, making up over half the Interior’s annual timber harvest, and is critical to the economic, social and cultural well-being of the province. A concerted effort by all levels of government and key stakeholders is necessary to deal effectively with the impacts of the epidemic. The Province is committed to action that will mitigate the impacts of this unprecedented epidemic on forest values, communities and the provincial economy in the short term, and ensure sustainability in the long term. Mitigation will be an ongoing process requiring two or perhaps three decades to complete. This plan provides a high level framework to direct provincial ministries and assist coordination between governments, industries and stakeholders during the next five years. It sets out seven objectives. Each objective will be achieved through the development and implementation of a coordinated strategy. The plan outlines a number of the key actions that will be taken to implement the strategies and achieve the objectives. Some actions will occur over the next five years, while others are scheduled to be done in 2006 and 2007. Encourage immediate and long-term economic sustainability for communities. Maintain and protect worker and public health and safety. Recover the greatest value from dead timber before it burns or decays, while respecting other forest values. Conserve the long-term forest values identified in land use plans. Prevent or reduce damage to forests in areas that are susceptible but not yet experiencing epidemic infestations. Restore the forest resources in areas affected by the epidemic. Maintain a management structure that ensures effective and coordinated planning and implementation of mitigation measures. 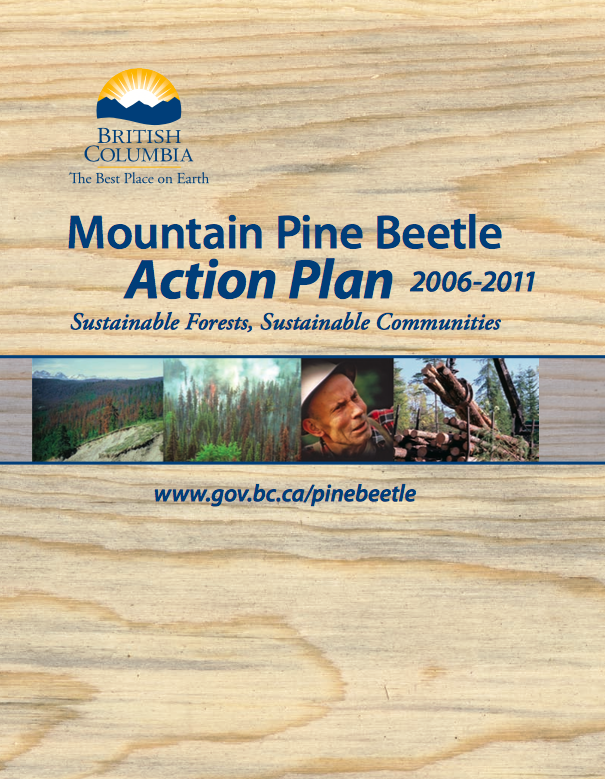 This plan, developed with stakeholder input, describes the provincial government’s response to the Mountain Pine Beetle epidemic, and will provide guidance to all groups involved in the mitigation effort. During the last year the Province and First Nations have been working toward methods of shared planning and activity. It is anticipated that by the next update of this plan in 2007, the objectives and actions will more directly reflect this cooperative approach.